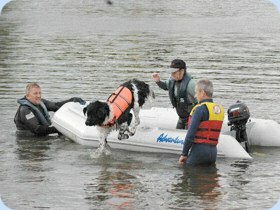 The Newfoundland has an unrivalled and well deserved reputation as a superb working dog in water. 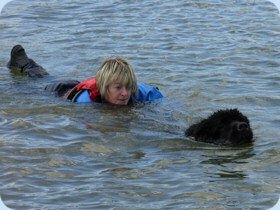 They are well adapted to water work having webbed feet, a thick double coat, large lung capacity and of course great size, strength and stamina. 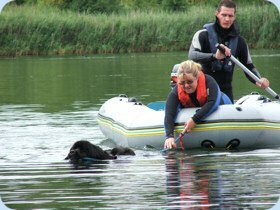 Throughout the long history of the breed there are numerous well documented accounts of Newfoundlands performing heroic rescues of persons drowning or in difficulty in water. The Southern Newfoundland Club organises Certified Water tests on at least two occassions during the year and our members regularly support and attend Tests and events organised by the Newfoundland Club and the Northern Newfoundland Club. You can find a list of forthcoming events on our SNC Events page. 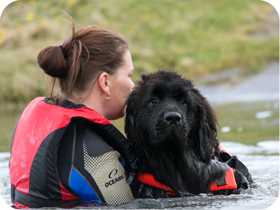 We are keen to promote the safe training and working of Newfoundlands so we strongly recommend that you join one of the many Working Groups around the country. Working groups provide a safer environment for training and you will find experienced owners and handlers who can offer advice and assistance in working with your Newfoundland, plus it's a lot of fun! You can call or email if you would like us to put you in touch with your nearest working group. Alternatively, a list of the UK Working Groups appears on our Links page.